According to the new market research report “Medical Aesthetics Market Product (Botox, Dermal Filler, Liposuction, Cellulite Reduction, Fat Reduction, Skin Tightening, Breast Implant, Tattoo Re moval, Thread Lift), End User (Clinic, Medical Spa, Hospital, Beauty Center) – Global Forecast to 2023“, published by MarketsandMarkets™, The global medical aesthetics market is projected to reach USD 17.07 billion by 2023 from USD 10.30 billion in 2018, at a CAGR of 10.6%. Medical aesthetic devices are used to improve the cosmetic appearance through the treatment of conditions such as liver spots, excess fat, scars, skin laxity, wrinkles, moles, cellulite, unwanted hair, spider veins, and skin discoloration. 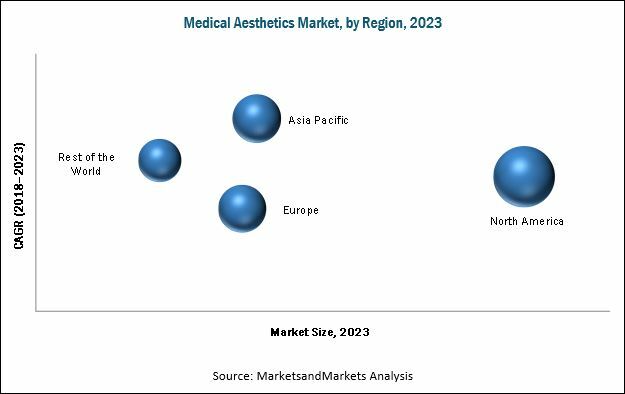 The global Medical aesthetic market is estimated to grow at a CAGR of 10.8% from 2016 to 2021 to reach USD 13.29 billion by 2021. Key factors such as the growing adoption of non-invasive procedures, growth in aging population, increasing awareness among customers, technological advancements in energy-based medical aesthetic devices, and increasing demand for aesthetic treatments among the male population are driving the growth of the aesthetic devices market. However, stringent safety regulations for aesthetic procedures, social stigma associated with cosmetic treatments, and low focus of market players on developing medical aesthetic devices for dermatological conditions are restraining the growth of this market. Based on product, the medical aesthetics market is categorized into energy-based devices, breast implants, facial aesthetics, tattoo removal, physician-dispensed cosmeceuticals and skin lighteners, physician-dispensed eyelash products, thread lifting, laser resurfacing devices, and laser hair removal. The facial aesthetics segment is expected to account for the largest share of the medical aesthetics market in 2016. The large share of this segment can be attributed to the growing patient demand for facial aesthetic treatments, increasing demand of non-invasive cosmetic procedures, launch of new products, and growth in aging population. In 2016, North America is expected to account for the largest share of the global medical aesthetic market, followed by Europe. The Asia-Pacific market is projected to grow at the highest CAGR during the forecast period, owning to key factors such as rising consumer awareness and interest in aesthetic procedures, aggressive marketing by leading U.S. and European companies, and rising medical tourism in the region. Over the past three years, a number of market players, including Cynosure, Inc. (U.S.), Syneron Medical Ltd. (Israel), Allergan, Inc. (U.S.), and Galderma S.A. (Switzerland) have strategically expanded their presence in emerging Asia-Pacific countries to leverage the high growth potential in the region. Allergan, Inc. (Ireland), Cynosure, Inc. (U.S.), Lumenis Ltd. (Israel), Mentor Worldwide LLC (U.S.), PhotoMedex, Inc. (U.S.), Galderma S.A. (Switzerland), Solta Medical, Inc. (U.S), Syneron Medical, Ltd. (Israel), and ZELTIQ Aesthetics, Inc. (U.S.) are some of the key players in the global medical aesthetics market.